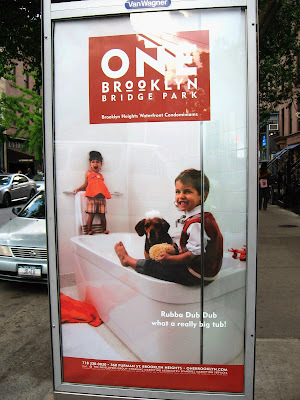 When hurrying past this pay phone ad on Montague Street in Brooklyn Heights, we unconsciously worry about these rambunctious little children. If they were ours, we'd probably start yelling at them to "Get off the side of the tub -- How many times have we told you!" etc etc. Especially the little girl in the back, who could crack her skull if she slipped on the wet rim she's standing on. But after passing by a dozen times we finally realized there's something more fundamentally wrong with this picture. When you look closer, the children appear to be too gleeful . . . so gleeful, they're almost scary. The kind of scary that bends forks and makes unpleasant people go away. Look at their faces. They laugh and cackle, and no one has the nerve to tell them to get off of that tub. Because they can't ever really hurt themselves, can they? 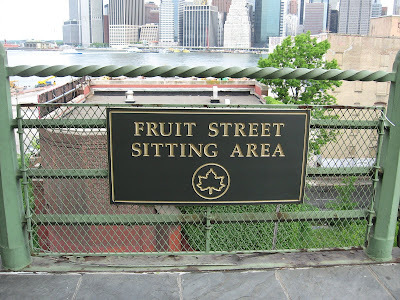 A sign declares that this part of the sidewalk overlooking the Brooklyn Heights Promenade is the "Fruit Street Sitting Area." So the other day someone wrapped themselves up and sat. And so the hand was buried in the ground. That night, the palm turned into gray bark and the fingers merged and grew . . . In association with Williamsburg Walks, the Williamsburg Gallery Association is hosting tours of the neighborhood's art galleries, led by art critic and art tour guide Merrily Kerr. A writer and trendspotter for magazines including Time Out New York and Flash Art, Merrily will take you to see the artwork and exhibitions that make Williamsbug a must-see for art lovers and the art-curious alike. Tours leave from the WGA table on Bedford Avenue between North 5th & North 6th Streets. Tickets are just $10 and can be purchased prior to the tour at the WGA table on Bedford Ave., or online through paypal. Visit the WGA online to purchase advance tickets. The tour will take in a range of work, from meditative sand paintings to kinetic sculpture, at and array of galleries, from plucky newcomer spaces to long-established anchors of the Williamsburg scene. This tour will demonstrate the diversity of Williamsburg's art offerings, from Weimar paintings to avant-garde contemporary. In a quirky apartment gallery or the post-industrial expanse of one of the area's newest and largest art spaces, come explore the unique visions of the city's most creative people. A bit of a kerfuffle seems to have broken out on Chowhound about Ignazio's Pizza, which opened in Dumbo at 4 Water Street in April. The reactions to the pizza itself encompass the usual range, from: "So delicious!" to "Just OK," to "Disappointingly bland," to "Even Grimaldi's is better." But this is Brooklyn, so the discussion quickly swerves from pizza to personal insults, like: "It was not a matter of a waitress with so many tattoos that it looked like garbage was thrown at her, or the white dreadlocked zombie serving drinks . . . "
And responses like: "What a surprise, another nasty rant from you . . ."
Counter-responses: "You seem to have some pent up hostility towards those who dare to look different and it is clearly manifesting itself here and that is unfortunate, especially to those who have not visited Ignazio's and are buying into this intolerant and distorted point of view. It comes off as very angry, and, frankly, old and cranky." Clarifications: "I shot the 'dumb hick' line in to mock those (at Ignazios) who apparently seem to feel this way." 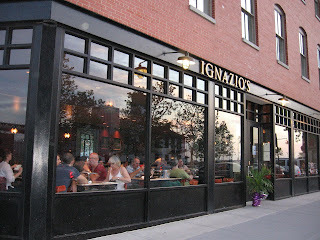 "We went to Ignazio's last night for the first time after a friend had recommended it. The location is spectacular, the pizza is fantastic but the real treat is the live jazz that made us feel we were in some classic NY movie! We will definitely be back." "As you know, the YWCA of Brooklyn is currently leasing Sister Strength Housing LP, an affordable housing rental apartment development that is contained within our facility at 30 Third Avenue in Boerum Hill Brooklyn. We currently have a limited number of studio apartments available and are currently accepting new applications. They do not have to live in Community Board 2. These airy, light filled spacious studio apartments have been completely renovated and contain private bathrooms and full kitchens. Several of the units are handicapped accessible. Those interested in receiving an application, may come in person to our offices at 30 Third Avenue (between Atlantic Avenue and State Street) Monday through Friday between the hours of 10 AM and 5PM. Applications will be processed "first come first served" so those interested in applying should submit their applications as soon as possible. Like things that jiggle? Thu Tran, the somewhat unusual star of IFC's cooking show Food Party was a guest judge last Saturday night at the Jell-O mold competition in Gowanus. Sarah Lohman’s Feedbag video, above, shows Thu exploring the world of Jell-O jewelry, a Jell-O chicken, Jell-O chicken and more. Those movements Thu makes incessantly with her fingers will have you feeling kinda squishy yourself. If you can't get enough of this competition, there's a whole in-depth Jell-O mold interview at Serious Eats New York. In other Jell-O news, here's the sad story of a descendant of the wealthy Jell-O clan who last year was denied any share in the family fortune by virtue of being born out of wedlock and given up for adoption. The iconic Kentile floor sign can be seen towering over 2nd Ave. and 9th St. Many have adopted it as a symbol of Gowanus. Perhaps that's fitting, as the tiles were extremely toxic. 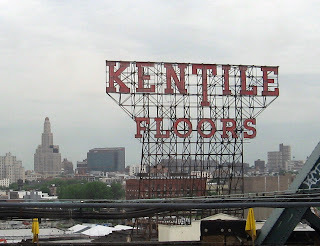 Forgotten NY says that Kentile was founded by Arthur Kennedy in 1898 and once billed itself as "America's largest manufacturers of super-resilient floor tile." Kentile filed for Chapter 11 in 1992 following a series of strikes and asbestos lawsuits -- it turns out that the tiles could be made up of as much as 25 percent asbestos. 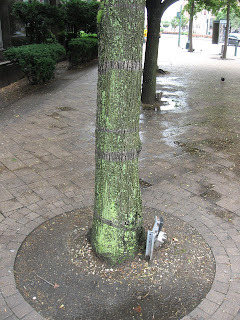 This tree at Fulton and Adams Streets in Downtown Brooklyn illustrates the idea that more moss grows on the north side of trees than on the south side. The reason is that the south side gets more sun, and moss thrives in shade. 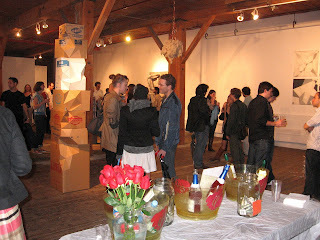 Lots of activities in Dumbo this past weekend. Beside the Brooklyn Hip-Hop Festival, which brought crowds to Empire-Fulton Ferry State Park, two exhibitions opened Saturday -- one at DAC, Structured Simplicity, and one at Smack Mellon, Beauty Underfoot. Structured Simplicity presents a group of artists -- Mai Braun, Hilary Harnischfeger, Elana Herzog, Fabienne Lasserre, and Amy Yoes --who work in sculpture and site-specific installation. Above, in the left side of the photo, can be seen Mai Braun’s stacked cardboard boxes. Beauty Underfoot at Smack Mellon is based on the John Cage remark, “Beauty is now underfoot wherever we take the trouble to look.” Artists include Adriana Farmiga, Petrova Giberson, Isola and Norzi, Fawad Khan, Gareth Long, Alison Owen, Mike Quinn, Yumi Janairo Roth, Jen Schwarting, Secret School and the K.I.D.S., Charwei Tsai. 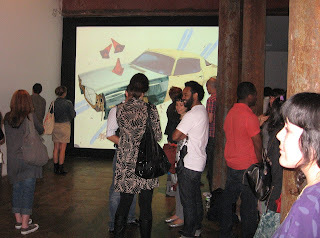 Above, Fawad Khan’s Hood (background) focuses on everyday objects that come to life around a car in a junkyard. 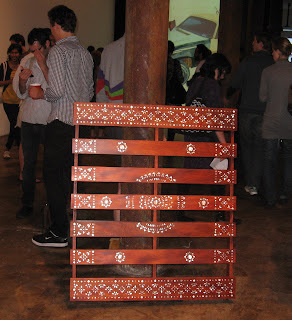 Yumi Janairo Roth works mother-of-pearl inlay into shipping pallets. Decent crowds showed up at the Brooklyn Hip-Hop Festival, video below, in spite of the rain. Review here. A four-story building at 493 Myrtle Ave. in Fort Greene (not far from Pratt Institute) collapsed around 2 p.m. this afternoon and five residents barely escaped with their lives. One person was taken to a hospital with minor injuries. The NY Daily News reports that the collapse "triggered a massive emergency response, as firefighters dug through the rubble to make sure that no one was trapped underneath." 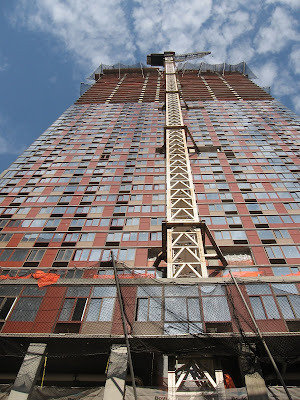 The NY Times Fort Greene Blog reported that the collapse also badly damaged the apartment building next door at 491 Myrtle: "Councilwoman Letitia James, who was at the scene, said that it would have to be demolished. All told, at least 14 people were left homeless." Notify NYC didn't send out a notice until 7:59 p.m. (thanks for the timely alert, NYC) that Myrtle Ave. was closed between Ryerson and Hall Streets. This Google maps pre-collapse photo shows the building with a big crack running down the side (that's the Vesper bar on the ground floor). The New York City Dept. of Buildings shows several complaints over the years regarding the crack, including one on May 1. Back in 1997, a complaint was filed by someone who said the building had cracks and was "shaking and vibrating." The inspector didn't observe any cracks, shaking or vibrating at the time of inspection. - Old Navy at Atlantic Center needs a logistics manager. GAP Inc.
Top photo by MikeColvin82, Creative Commons license. 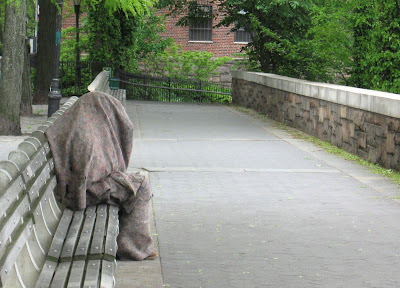 Today Only the Blog Knows Brooklyn published a thoughtful response from Principal Flanagan. Among other things, we learn that the pastor who fired Flanagan -- Father Daniel S. Murphy -- told him last April "that we had had the best year yet working together." It appears that in spite of all of the positive things Principal Flanagan has done for St. Saviour recently (instituted a new French program; guided the library renovation; hosted successful Art Fairs and several seasonal concerts; restarted Science Fairs & oversaw the installation & implementation of Smart Board technology & LCD/Laptop instruction), the major bone of contention may have been his resistance to raising tuition at St. Saviour. A lot more, it seems. The Brooklyn Heights Blog reports today that chef Dan Kaufman was arrested on Jan. 20 for an incident on the Upper East Side in which he allegedly stole a credit card from a friend, whose apartment he was visiting. He then made a purchase at a McDonald’s on the west side, "where security cameras there captured his every move." The restaurants folded last year, mired in scandal after the arrest of Kaufman for identity theft and credit card forgery. The Busy Chef saga never ends. 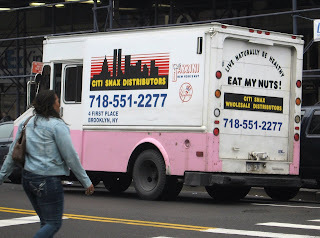 This snack truck parked on Court Street in Downtown Brooklyn caught our eye -- not because of the unusual pink color, but because the snappy phrases on the back (Eat My Nuts!) and the front (My Nuts Are My Life!). What more could go wrong with anyone in any way connected with the failed Busy Chef Brooklyn restaurant chain? Now it seems that Busy Chef's landlord Alan Young (and local attorney) has been disbarred for “his inability to successfully defend himself on the merits against any disciplinary charges which may be brought against him," according to the Brooklyn Eagle. Young was what -- owner? Partner? with Dan Kaufman, credited with driving the Busy Chef and other restaurants out of business by allegedly stealing thousands from customers and the business itself. The top two dresses shown above are created by designer Catherine Edouard Charlot from HIMANE, and are made from recycled materials. 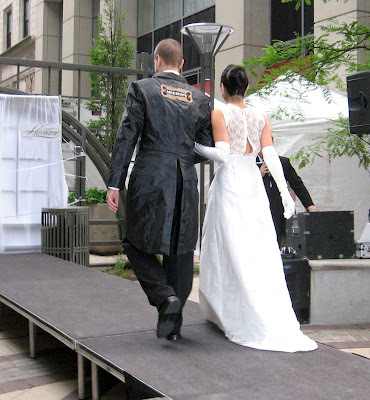 The wedding duds shown above are also created by Catherine Edouard Charlot; note that the man's tuxedo is made from recycled umbrellas. 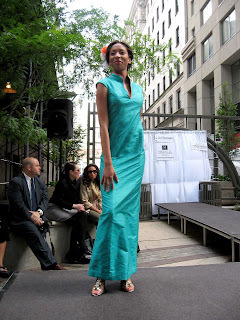 These next dresses shown are made by Yvonne Chu of Kimera Designs. Local wedding vendors were showing their wares inside Morton's at an affair catered by Morton's and Love Brooklyn Tours & Events. 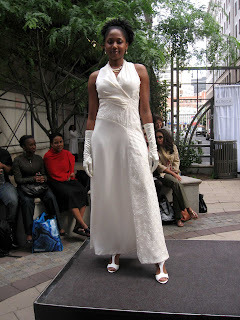 The point of the event was to show that you don't have to leave Brooklyn to plan your wedding. More here. Walk? Don't walk? 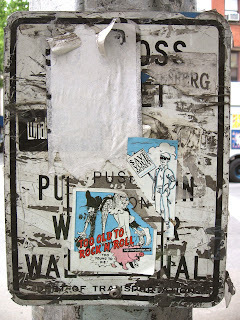 Too old for rock 'n roll? A piece of plywood fell from an upper story at 111 Lawrence Street near MetroTech Center in Downtown Brooklyn yesterday, and work has been halted, according to the Brooklyn Eagle. The DOB reports that two cars parked on the street were hit by the debris. 111 Lawrence will be Brooklyn's tallest building when completed. 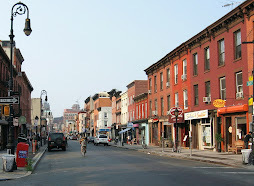 The first 2009 "Williamsburg Walks" takes place Saturday, June 20 on Bedford Avenue between North 5th & North 6th Steets, noon to dusk. The Walks features artists working and interacting with the community, musicians playing on the Avenue, educational programs from local studios, and complimentary virgin cocktails. 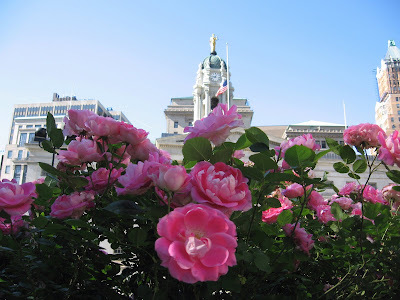 More Walks every Saturday through July 11. Afghanistan: Should US troops be there? What will happen if we leave? takes place Wednesday, June 24, 7 pm. With Elizabeth Gould and Paul Fitzgerald, authors of Invisible History: Afghanistan’s Untold Story. Gould and Fitzgerald will explain how American actions today are connected to past miscalculations, and how U.S. policy puts both Afghans and Americans in danger. They will lead a discussion and answer your questions about the complicated tangle of political, cultural, and historical factors that combine to create the current situation. The authors have been reporting from Afghanistan since 1981 for CBS, PBS, ABC. and other news organizations. 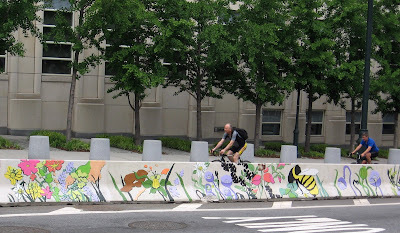 The Jersey barrier separating the bike lane from Tillary Street is suddenly a thing of beauty, covered with flowers and bumblebees. It turns out that the Downtown Brooklyn mural was created by high school-age artists as part of a collaboration between the Groundswell Community Mural Project and the city Department of Transportation. 1: Run one bus all the way from Dumbo (along Cadman Plaza West) to Red Hook. That way, people in Dumbo and Brooklyn Heights can access the great shopping and restaurants in Cobble Hill, Carroll Gardens, Red Hook and Boerum Hill, and people south of Atlantic can visit Dumbo and Brooklyn Heights without having to transfer. 2. How about a trolley to Red Hook? Having Problems Connecting Your Digital TV Converter Box? Show you how to operate your converter box and features such as closed captioning. The contractor provides these basic home installation services free. These services are paid for by the FCC, and an FCC contractor will not request any payment from you for their services. New York City is finally talking tough to bed bugs. As part of its nine-step program to eradicate the pests, they have installed signs in bus shelters warning bed bugs that they are not allowed in the shelters or on buses. Reading "Bus Stop For Humans Only," the signs show an illustration of a bed bug inside one of those "No" symbols with a diagonal red slash. Glad to see the city is finally taking the bed bug plague seriously. Now let's hope that the bugs read the signs. 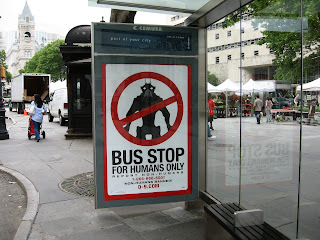 In other parts of the country where the bed bug problem is not yet severe, people might think this sign reading "Bus Stop For Humans Only" is an ad for an upcoming movie, maybe. Those booming fireworks heard over Brooklyn and lower Manhattan Saturday night were for Children's Day at the South Street Seaport, hosted by Gordon from Sesame Street, sponsored by Target. 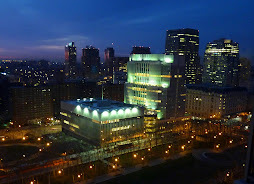 The Brooklyn Philharmonic also performed. UPDATE: Where to see the 2009 July 4 fireworks in Brooklyn. Riverside Apartments, Brooklyn Heights, Gets New Tenant? 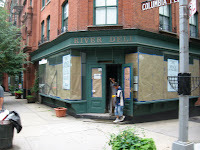 After years of going empty, it looks like the old Riverside Deli on the ground floor of the Brooklyn Heights' historic Riverside Apartments at Columbia Place and Joralemon Street is getting ready for a new tenant. Workers have been giving the site a redo for the last week or more. 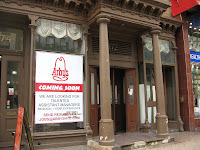 One worker told McBrooklyn that he thought a new deli would be going in. 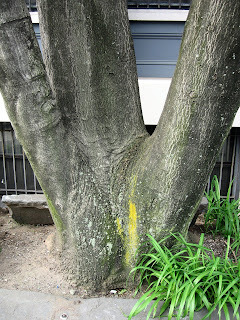 Last month, a tree in the Riverside Apartments' courtyard "with a trunk so large it couldn’t be embraced by tree-huggers” was dedicated to the memory of Brooklyn humanitarian Alfred Tredway White (1846-1921) at the Willowtown Association’s annual fair. 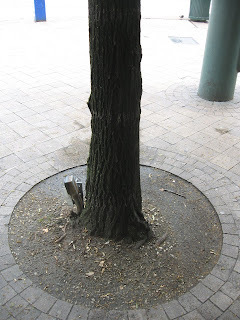 The tree and several other towering elms and sycamores are to be uprooted if a proposed parking garage is constructed in the courtyard, according to the Brooklyn Eagle. Whether or not one approves of the controversial Dumbo Dock Street project, which will appreciably degrade historic views of and from the Brooklyn Bridge, the tactics employed by the Walentas family and their real estate company Two Trees has certainly changed the way they will go down in the history books. Today the City Council approved the hulking project. But approval came only after Two Trees poured hundreds of thousands of dollars into the coffers of influential council members and colluded with the School Construction Authority (SCA) to mislead the public into thinking that the SCA actually investigated the best options for local school children. Now the Dumbo Neighborhood Alliance is asking the Attorney General for an investigation, and rightly so. Opponants to Dock Street include more than 25,000 local residents who signed petitions and postcards, 8 neighborhood organizations, the National Trust, the Municipal Art Society, the Historic Districts Council, Architecture Society of New York City, the Roebling Society – Chapter for Industrial Archeology, the American History Museum of the Smithsonian, Pulitzer Prize winner David McCullough, cinematographer Ken Burns, the Roebling Family and more. Supporters include some parents who think that their children might get into the small middle school (300 seats, as opposed to the more typical 500) that Walentas promised, and those who will make money from it -- or who already have. David Walentas was once admired for jump-starting the transformation of Dumbo. Now, whether or not Dock Street is actually built, the Walentas name will forever have an asterisk next to it. That's the dome of Brooklyn Borough Hall in the background. Sales were halted, the sales office was dismantled, lawsuits are flying-- Now there's a hole you could drive a Prius through in the roof of 20 Henry Street -- the "Candy Factory" building -- visible under the torn blue tarp in a photo published in today's Brooklyn Eagle. Since the trouble began at 20 Henry, we've had rain, rain, rain. Maybe that curse the exiled artists put on the place worked after all . 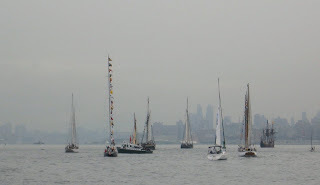 . .
As part of a statewide yearlong celebration to mark the 400th anniversary -- the Quadricentennial -- of the discovery of the Hudson River by Captain Henry Hudson, a flotilla of historic ships set sail up the river Saturday morning. Their destination (as was Captain Hudson's, though he didn't know it at the time) is Albany, which they should reach by the 13th. 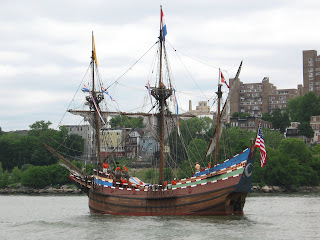 The flotilla was led by a scale reproduction of Hudson's ship the Half Moon (above), which sailed to New York from Amsterdam, manned by 18 volunteers. As the ships travel north, they pause by waterfront communities celebrating with festivals, music and parties. Today (Tuesday), they'll arrive at Beacon/Newburgh, where they'll stay for educational programs til late afternoon. See the whole schedule here. Part of the celebration includes NYS Quadricentennial Legacy Projects like the creation of a park at Governors Island, the site of one of New York's first Dutch settlements. The Dutch royal family will be coming to town to visit, and a Governors Island Dutch Festival takes place on Sept. 13. According to the Brooklyn Eagle, there are more than 1000 events planned to celebrate this year. For example, a musician in Poughkeepsie has turned an entire bridge spanning the Hudson into a musical instrument. In September, a variety of workers in New York and Amsterdam will swap jobs for a week. There are concerts, exhibitions and events up and down the Hudson all month, and more this summer. 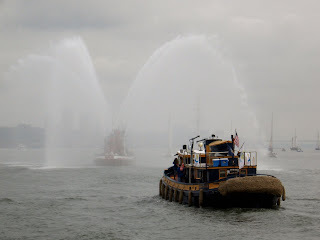 The Henry Hudson 400 Foundation will celebrate with commemorations in both Amsterdam and New York City, including a three-day event in September 2009 around Battery Park with special exhibitions planned throughout the city. 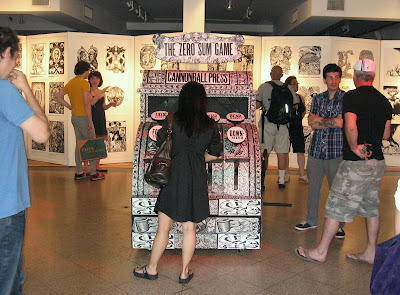 Cannonball Press at Axelle Gallery made a big splash at this year's ArtWalk with their giant cash register, "The Zero Sum Game." The register's buttons say things like "Foreclosed," "Ponzi scheme," "Downsized," and "Trashed Savings." 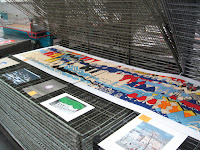 It's fascinating to see how Cannonball/Axelle produces their and 4' x 8' prints prints; if you missed the upstairs production facilities, make sure to get up to the 3rd floor next year. Here's one of a series from the Clover Cafe and Gallery. This is the first time we've been inside Clover, and we recommend a visit anytime you're in the neighborhood. 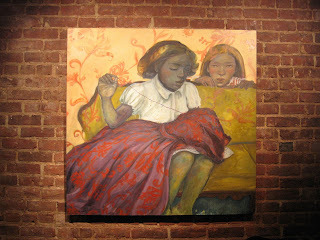 Foolishly, we didn't find out the name of the artist -- can someone fill us in? An everyday scene on Atlantic, ArtWalk or no ArtWalk. 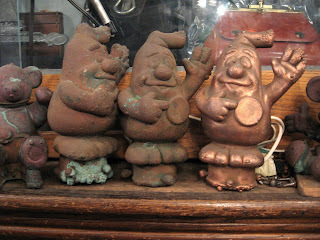 We loved these little guys sitting on a shelf at the Atlantic Antique Center. Can't put our finger on where we've seen them before. Are they some kind of commercial figure? Wonderfully weird FOOD PARTY, created and hosted by Williamsburg fringe artist Thu Tran and her cast of bizarre puppets, is coming to IFC (Independent Film Channel) June 9 at 11:15 p.m. This six-part IFC Original Comedy’s series appear in 10-minute episodes. Food Party has been described as a "psychedelic melding of Pee Wee’s Playhouse and The Rachael Ray Show with a dash of J-Horror vibe." It's shot in Williamsburg in a technicolor handmade, cardboard kitchen. Characters include Italian Chef, Ice Cream Cone, the amorous Monsieur Baguette, Thu Tran clones, Especially Psychic Spud (E.P.S. ), Perv Corn and The Devil. The webseries won the ‘Outside of the Box” prize at the 2008 NY Television Festival. The NY Times ran this article about Trans Friday. Lev Yilmaz makes funny, hand-drawn animated films about "anxiety, awkwardness and existential emotions." He'll be reading from his new book Sunny Side Down at the show. His YouTube videos have accumulated 11.5 million views as of May 2009. Here's one called Conversation. You can find more films here. 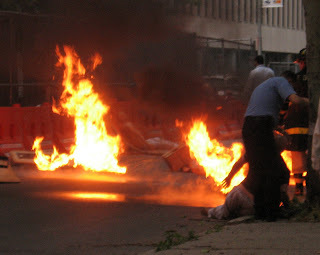 Cadman Plaza East in Downtown Brooklyn/ Brooklyn Heights was aflame last night when the Office of Emergency Management held a CERT training operation. 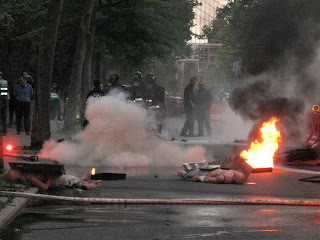 Bodies, both real and synthetic, littered the street next to Cadman Plaza Park. Ball players in the park rushed to the street to see what what going on. 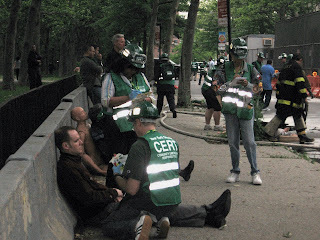 CERT trainees, wearing green vests, ministered to the "victims." A couple of weeks ago parents at St. Saviour Elementary School in Park Slope were shocked to learn that their principal, Mr. James Flanagan, was being fired. Principal Flanigan has successfully led St. Saviour for 26 years, and the pastor who fired him -- Father Daniel S. Murphy -- is a relative newcomer, arriving in 2004. The scene: Crying teachers, confused kids, devastated parents, and questions, questions, questions, which, up til now, Father Murphy has not answered. Only the Blog Knows Brooklyn has been following this story, and now the Brooklyn Eagle has published remarks by the Diocese and Father Murphy which seem to have them pointing fingers at each other. Father Murphy told the Brooklyn Eagle Wednesday that he was "carrying out Bishop DiMarzio’s long-term vision for the Diocese, called Preserving the Vision." “He keeps order and he’s pretty strict. It’s a strong position and maybe some people don’t like it, but that’s a part of the reason we’re here. He runs a tight ship; everybody’s safe and they do the right thing . . . In a weird way, we feel like he’s our dad. He keeps everything classy and right. There’s no messing around, no mystery; he’s just solid." Isn't that what you want in a Catholic school? 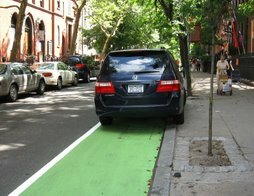 Adams Street Brooklyn -- Always Accident Prone? The falling derrick caused pandemonium. Scores of live wires threatened instant death to terrified pedestrians. When the derrick came into contact with the live trolley wires, it formed a circuit that caused flames to explode across the tops of Downtown Brooklyn buildings, including the Citizen Building. Amazingly, not one person was killed. See the Times for the full story. 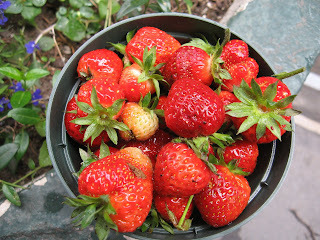 We got to the strawberries before the critters did! They're coming in fast and furious now. The Cinema 16 series is one of the finer examples of curation, DIY spirit, and collaboration in Brooklyn-based entertainment. The premise is simple enough: obscure, visually engaging short films paired with live scores, written and performed for these films by local bands. For this installment, Nick Yulman and the Bone Conductor Mechanical Orchestra score three films: Georges Méliès' magical short L'Homme Orchestre (One Man Band), Charles Bowers’ long-lost comical romp A Wild Roomer, and Maya Deren’s surrealist masterpiece Meshes of the Afternoon. 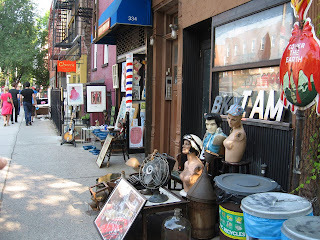 Going to the Dumbo Flea this Sunday? Add on more Dumbo retail fun: A group of local independent clothing and jewelry designers working out of Dumbo have organized a weekend shopping event for this Saturday and Sunday (and perhaps ongoing every weekend), June 6th and 7th. 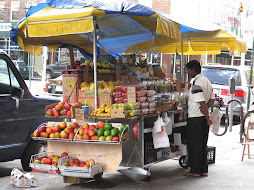 The indoor Corner Mrkt is on the corner of Jay and Front streets. Aimee g, Arza Design, Cinderloop, Lauren Wimmer Jewelry, naturevsfuture, Radka Design, Rebecka Froberg, SAMOY LENKO, and more. On Thursday, June 4, for the occasion of “Brooklyn Day,” Teddy’s Bar & Grill, at the corner of N. 8th & Berry Streets in Williamsburg, will celebrate one of Brooklyn’s greatest and most famous assets: community. There will be a night of fun, music and appreciation for the struggle of neighbors to build and improve their neighborhood. Teddy’s is Brooklyn’s oldest continuously operating tavern. Borough President Marty Markowitz is the invited guest of honor. Council Member David Yassky is also expected to attend. Local Brooklyn heroes will be honored for fighting for affordable housing. Festivities begin at 7pm, with “DJ D” spinning the sounds of Brooklyn-born recording artists. A music I.Q. test will be administered as “DJ D” hosts Brooklyn Bingo. Brooklyn Brewery will distribute promotional items and Yankees vs. Mets tickets. Brooklyn recording artist Strafe (“Set It Off”) will make a guest D.J. turn. There will be a drawing for the monthly rent party. Half of the cash pot goes to the winner and the rest to build the new Northside Town Hall, once known as the “People’s Firehouse. Teddy’s Bar & Grill has been a popular fixture in the community since it was built in 1887. Mae West once resided in an upstairs apartment. Teddy’s was an important political center, a meeting spot of Brooklyn’s own Tammany Hall.